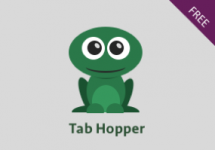 Have you ever wanted to display a character in Excel which isn’t on the keyboard? Maybe you’ve wanted to use a ÷ or maybe an ü, but you just weren’t able to find it. A standard keyboard can produce 96 characters, but lots fonts include up to 255 characters. Most countries have different keyboard layouts to each other and can access different characters directly from the keyboard. It does not matter which keyboard we have, as all of those characters are available to us, we just need to learn where to find them. Just type a description of the symbol you want into your favorite search engine. 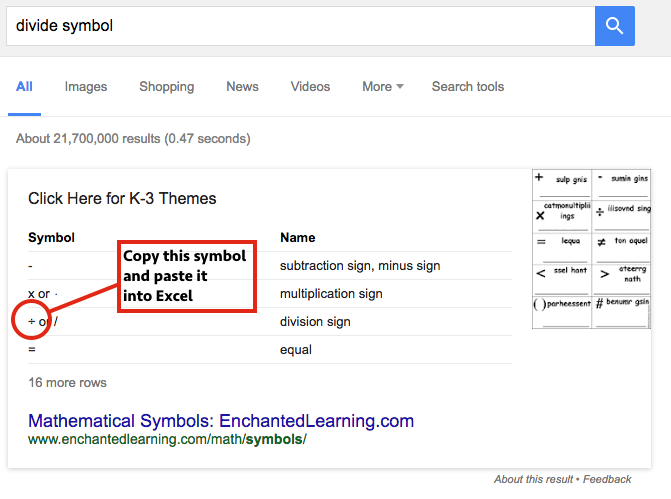 For example type “divide symbol” and click search (see my example search below). Highlight the symbol, then copy and paste it into Excel. Search through the available characters and click Insert. 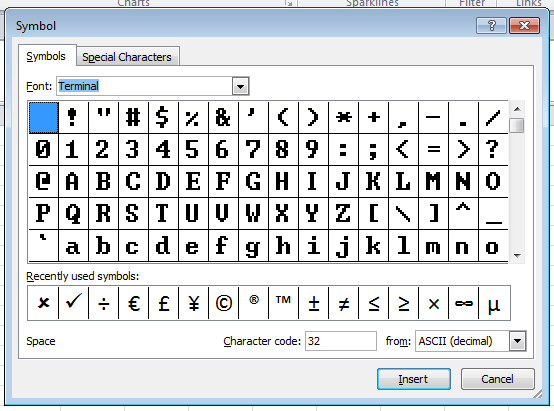 To insert the characters simply hold down the ALT key and type in the code, then release the ALT key. For example character 36 (the $ symbol) would become ALT + 36. For Excel users, ALT + 7 is very useful as this will insert a bullet point into the cell. If you have a suppliers, customers or employees whose names include special characters, those characters are available too. Too many codes to remember? Are you thinking you’ve got to remember 255 character codes? That sounds like a few too many, doesn’t it? 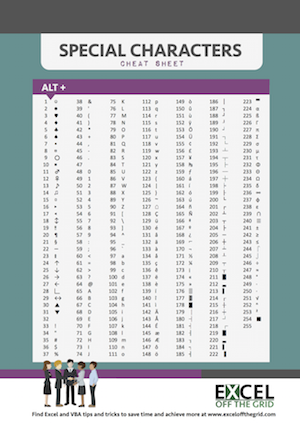 The good news is that you don’t have to; you can use my Print & Pin Special Characters Cheat Sheet. Print it out and pin it to any flat surface near your desk. Now you can refer to it anytime you need. Existing newsletter subscribers can enter their name and e-mail address into the form below for instant access the download. Or, you can also enter your name and e-mail address below to become a subscriber. Unfortunately, these codes are only available to those with a separate numeric keypad on their keyboard. Some laptops have additional keys to which may activate a section of the keyboard to operate as if it were a numeric keypad – that will work too, but depends on the model you’ve got. For all other users the copy and paste from the internet or Insert -> Symbol methods are the best options. 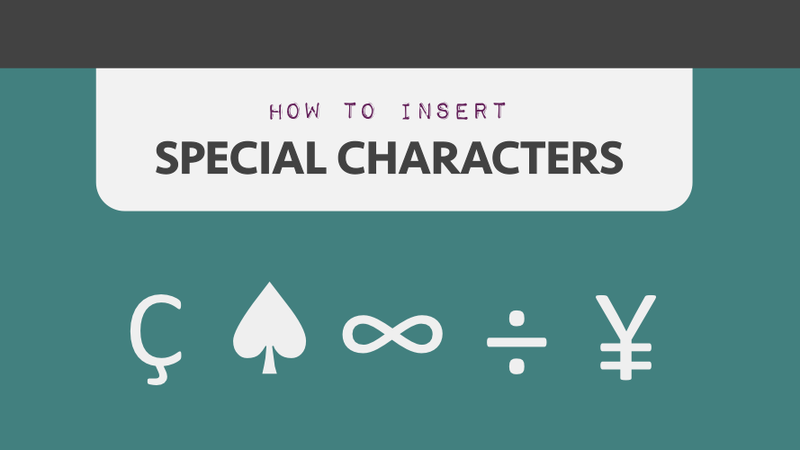 Also, note that not all characters exist in every font set and some font sets may contain different variations to those in the Print & Pin Special Characters Cheat Sheet.